""This comes up over and over: Whenever you end up solving an accessibility challenge, you end up solving other problems you didn't even know you had..."
"As members of the math-ed community, we have a responsibility to make sure this integration happens authentically, and in a way that supports math instruction instead of undermining it." Bootstrap founder and co-director Emmanuel Schanzer speaks about the origins of Bootstrap, and the impact of teaching Computer Science and Algebra together. "Schools and educators should be encouraged to teach the basics of CS through regular K-8 math and science classes...using Project GUTS and Bootstrap as models of how to do so..."
"Bootstrap has trained more than 30 teachers from 15 to 20 schools in a computer-science course aimed at students in grades 7 through 10." "It was immediately obvious that the blend of mathematics and computer science, reinforced by sound pedagogy and an eye on the needs of all students, would serve our purpose well." "The project will train 20-24 New York-based physics and physical science teachers already skilled in Modeling Instruction to learn the novel math-based programming approach known as Bootstrap." "Because CS is an active and applied field of Science, Technology, Engineering and Math (STEM) learning that allows students to engage in hands-on, real-world interaction with key math, science, and engineering principles, it gives students opportunities to be creators - not just consumers - in the digital economy..."
"A nationwide effort the Obama administration announced yesterday to bring computer science education to students will include a program developed at Worcester Polytechnic Institute and Brown University." "A computer science curriculum, developed in part by faculty at Worcester Polytechnic Institute and Brown University, will support a new White House initiative to bring computer science education to students across the country." "If even a small percentage of all working algebra teachers use Bootstrap, you've just tripled or quadrupled the number of people teaching programming." eSchool News :: "Study asks: Can math teachers teach coding?" "The study, funded by a National Science Foundation grant of nearly $1.5 million, is of critical importance as middle schools and high schools across the country look to integrate computer science into their curricula..."
SIGCSE :: "Transferring Skills at Solving Word Problems from Computing to Algebra..."
"Bootstrap's programming model and choice of programming language allow students to directly apply problem-solving processes for programming to standard problems in algebra". Boston Globe :: "Volunteers teaching algebra through computer coding"
"The tech-ed movement has created a number of beautiful tools, but teachers need more just than a piece of software to teach: they want lesson plans, a scope and sequence, homework assignments, quizzes, and handouts." The math that students will be learning about this summer will have context, she said, because students will learn it to be able to create the videogames. Brown University :: "Students 'bootstrap' algebra from video games "
"But algebra isn't the only thing students learn through Bootstrap. They also become familiar with ins and outs of coding, a crucial skill in an increasingly digital world. When students present their games to their classmates, they're also expected to stand up and explain the code that makes it work - an exercise software engineers call a code review." "I had students who were amazed that when they played Call of Duty that shooting the enemy required a programmer to use the pythagorean theorem in the programming," said Peter Isham, a teacher at the McKinley Middle School in Boston who has used Bootstrap in a summer program." GoLocal Worcester :: "Computer Science is Critical Thinking on Steroids"
"Media efforts are trying to attract kids, especially girls, to coding. But coding is to programming what spelling and grammar are to writing — structurally essential, but not the point. They're tools to make it work. A whole lot of thinking and designing needs to take place first." GoLocal Providence :: "In US Schools, Incorrect Answers are Un-American"
"You construct a function from the little ingredients. When you understand the relationships in your function, the numbers are just incidental. Mathematicians know this. Functions are just little machines. They're often written as tables where the function of time is to place the cat image at X distance from the right. Every time I make this picture I change the Time and the coordinates. Yes, these are numbers, but pictures are involved." Boston Globe :: "Will teaching kids to code boost math SAT scores?" "It's not enough to just teach kids some programming language and magically expect they'll make the connection to math skills," Schanzer said. "Teachers have to point out explicitly how functions taught in programming will be seen again in their math class." A teacher in Ontario presented his incredible class at the BringITtogether conference in 2013, and several of his students joined the presentation. You can watch the trailer he prepared for the presentation here. iNSolution Research Blog :: Build a game. Learn math. Be cool. But in the end students don't just learn how to answer algebra test questions. They learn algebra. They also learn programming, and, perhaps most importantly, that these two seemingly nerdy activities can grant them access into one of the coolest, most rapidly growing fields around. The Bootstrap curriculum goes beyond writing code, Schanzer says, by using programming language that promotes higher-level thinking: how to attack an algebra problem, break it down into parts, and follow steps for coding and solving mathematical problems. This semester marked the fourth time Tyler Rosini, a computer science and finance combined major, has volunteered to teach through the program. "I like the idea of giving back to kids," said Rosini, who recalled being inspired to participate when Bootstrap creator Emmanuel Schanzer pitched the opportunity during one of Rosini's first-year classes. On May 3rd, 2013, our partner organization FATE hosted the second annual Bootstrap Expo in Philadelphia, showcasing the incredible work done by Philadelphia students and volunteer teachers. 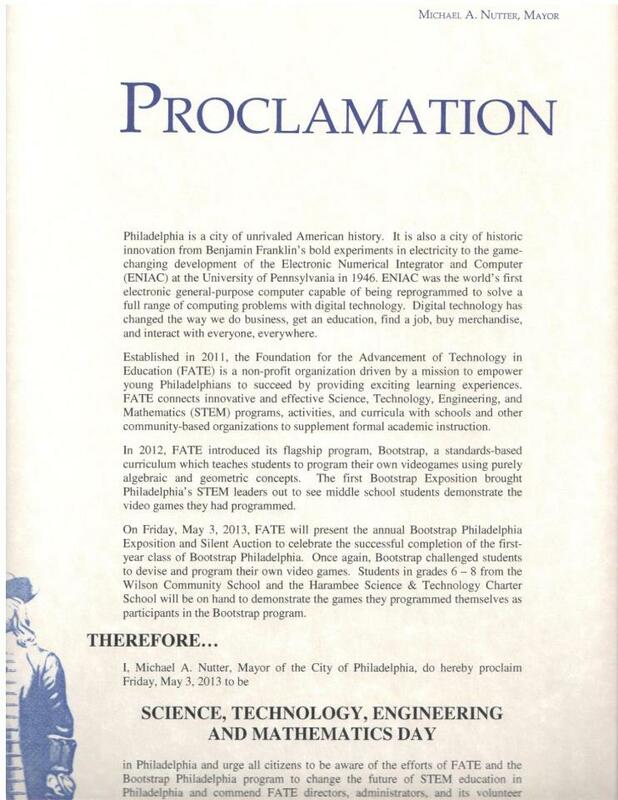 Mayor Michael Nutter issued an official proclamation, honoring FATE's work in bringing Bootstrap to Philly students and declaring the day to be Philadelphia STEM Day. [Zora] has become the youngest individual to create a full version of a mobile application video game, which she unveiled last month in the University of Pennsylvania's Bodek Lounge during the university's 'Bootstrap Expo.' Seven-year-old Ball has also become a master of the Bootstrap [curriculum], and when asked, Ball was able to reconfigure her application on the fly. Also published in the New Pittsburgh Courier and on Mashable.com. "After the program, students showed significant improvement in their understanding of variables and functions, although perhaps the most important change was how they viewed the work..."
Huntington News :: "Giving through Gaming"
Brown University :: "Middle-schoolers are ready, ready, ready for programming adventure"
"We saw a huge improvement in their comprehension of order of operations and what a function is..."